To Sum It Up: In the western part of the United States now known as the Republic, fifteen-year-olds Day and June lead drastically different lives. Day hails from a poor sector and is the Republic’s most wanted criminal. June was born into an upper class family and is poised for a promising career in the Republic’s military. When June’s brother Metias is killed and Day is fingered as the culprit, June goes undercover to find Day and bring him to justice. June’s quest for vengeance and Day’s struggle to save his family lead both teenagers to discover how much the Republic has ruthlessly manipulated both of their lives. 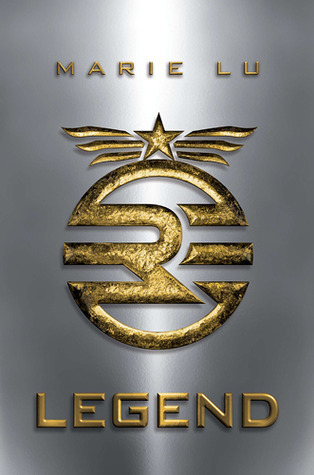 Review: Legend is the first YA dystopian novel that I’ve read since The Hunger Games trilogy, and it didn’t disappoint. The absorbing plot, top-notch pacing, and compelling characters kept me turning pages into the wee hours of the morning. I’d been in a bit of a reading slump, and Legend broke me out of it. When I first realized that the story was told from the alternating perspectives of the two main characters, I was a bit skeptical. In my past experiences reading books with multiple points-of-view, there would inevitably be one POV that I liked less than the others. This was not the case with Legend. Day and June both have intriguing stories. He’s fighting not only for his own survival but also for that of the family that he can only steal occasional glimpses of due to his fugitive status. She’s a soldier-in-training who’s never questioned the Republic’s teachings and knows nothing of the hardships which Day has dealt with all of his life. Even though I found June haughty in the beginning of the book, I understood why she was like that. She’d never found herself outside of her privileged sphere. By the end of the book, she’s certainly humbled. Day needs a paragraph all to himself. I think that I have a new book crush. He’s smart, clever, and fiercely dedicated to his family. He exudes cool without trying. His story is really heartbreaking at times, but he continues to fight. There were two things about the book which kept it at four stars. I found the romance element a little sudden and unconvincing. Then again, I like my romances to build slowly; I guess that I’m not much of a believer in love at first sight. I also would have liked more background on how the United States split into the Republic and the Colonies. Perhaps more will be revealed in the sequel. All in All: Considering how crowded the YA dystopian genre is right now, Legend is a solid entrant in the field. I’m looking forward to the next installment of the series (more Day- yay!). You should read some more dystopians. Yes there is a lot of them out there, at the moment, but some of them are definitely worth a read. Like the review. I definitely plan on reading more dystopians, especially Divergent, which has been lying unread on my bookshelf for too long. Thanks! Sorry to hear that it didn't work for you.